How to buy a satisfactory shower room? It has become a lot of family problems. For different home furnishings, the shape of the bathroom and the use of the area, consumers can shower from the appearance, function and security aspects of the purchase. In the past, many people will choose to separate a corner in the bathroom as a bathing area, or simply put in the bathtub. But the area of 4,5 square meters in the small bathroom, the bath is difficult to clean, poor insulation capacity has not been popular. Shower room with modern fashion modeling, flexible size, simple and quick installation process and other advantages come to the fore, in the bathroom industry occupies a place. There are plans for the decoration of the shower room to pay more attention. I see from a number of bathroom building materials store, and now the shower room shape beautiful fashion, has long been breaking the white dominate the world situation, silver, gray, blue and other bright beautiful colors to attract people’s attention. 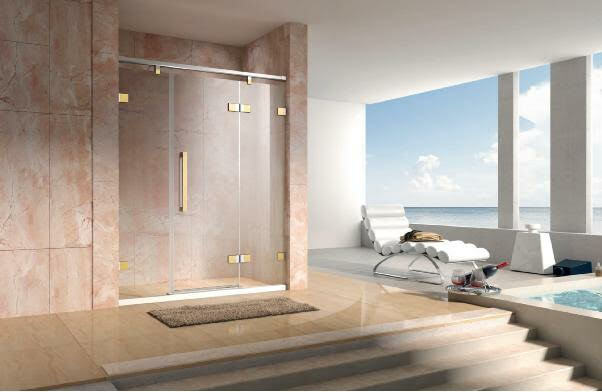 At present the market on the shower doors chassis texture ceramic, acrylic, glass steel, European plastic plate; and quadrant, corner, walk in shower enclosures, diamond-shaped and other shapes to meet the different consumers for the pursuit of beauty. Fence with glass shower doors, according to the structure can be divided into sliding glass shower doors, folding doors, shaft doors and so on. Consumers can be for their own needs, with a different match. In the Dabbl shower room store there are the full range of shower room, fashionable style, is indeed a rare bathroom industry, luxurious atmosphere, elegant fashion, simple and bright, everywhere reflects the intention of the Foshan shower room manufacturers. Car-level safety explosion-proof tempered glass, carefully selected, carefully polished space aluminum, safe operation of 100,000 times the hinges and pulleys … all do not see Dabbl shower room professional details, good quality industry character. So I have reason to believe that in the Dabbl shower room, you can find what you need, you are satisfied with what you want.